Padang Besar to KL ETS train is one of the most popular train routes in Malaysia because this train service connects Thailand to the most popular city in Malaysia. Many, especially the tourists prefer to take ETS train from Padang Besar to KL to experience Malaysia train ride after their trip in Thailand. If you are lucky, the train ride from the northern part of Peninsular Malaysia offers a stunning view of the green paddy field in Kedah. Then, slowly as you approach the city, you get to see the amazing architectures of the sky-scraping buildings in KL. Besides, there is no flight from Padang Besar to KL and train offers a more comfortable ride than bus. Therefore, Padang Besar to KL ETS train is definitely the best option to travel between these two locations. Padang Besar to KL ETS train is available on the Gemas-KL Sentral-Padang Besar and Gemas-KL Sentral-Butterworth routes. 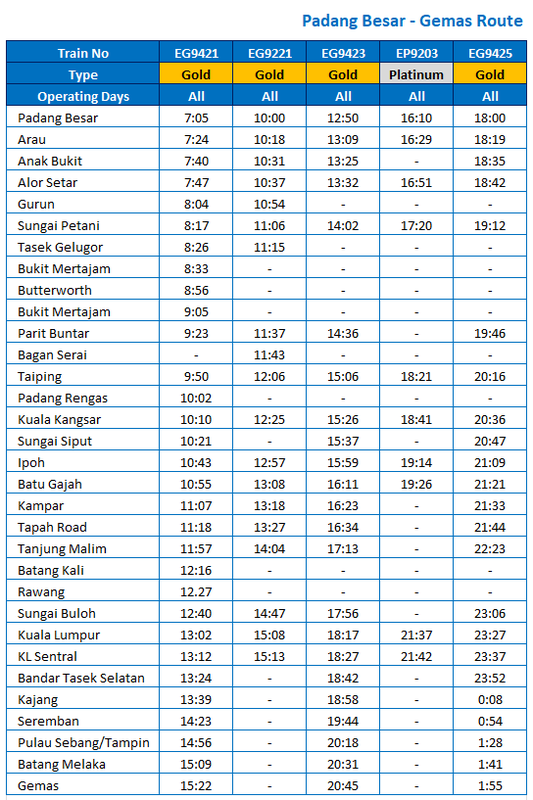 Click here to see the Padang Besar to KL ETS train schedule, released on 18 December 2017. * Changes to schedule are at the descretion of operator. Padang Besar Train Station is located in Perlis, exactly at the border between Malaysia and Thailand. The train from Thailand by the State Railway of Thailand (SRT) is connected to the Malaysia train service by KTM. For those coming from the Thailand can do the immigration process in the train station. After that, passengers can proceed to the train platform and wait for the ETS train to pick up the passengers. The arrival points for ETS train from Padang Besar to KL include KL Sentral and Bandar Tasek Selatan. Both KL Sentral and Bandar Tasek Selatan are among major transportation hubs in Kuala Lumpur. KL Sentral is a more popular arrival point because KL Sentral is connected to various types of public transportation such as LRT, Monorail, KLIA Transit, KLIA Express and many more to connect passengers to their next destinations. Meanwhile, Bandar Tasek Selatan is popular because of its connection to express buses. Passengers can also use LRT, KLIA Transit, RapidKL bus or taxi to go to their next destination once they reach Bandar Tasek Selatan station. The train is comfortable and suitable to facilitate senior citizens and the disabled. Booking your ETS tickets in advance at BusOnlineTicket.com is easy as you get to see the tickets schedule and availability and book your tickets right away online. BusOnlineTicket.com offers various payment options such as credit card, internet banking, PayPal, DBS Paylah, 7-Eleven and many more for the convenience of our customers. So, book your Padang Besar to KL ETS train ticket online and secure your seats today! 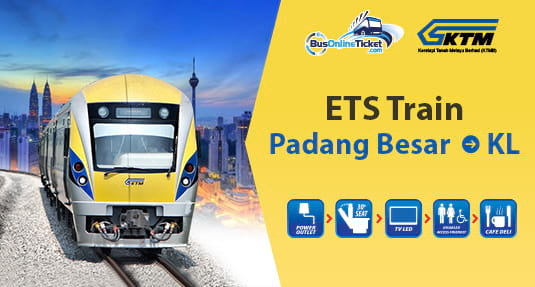 Easily Book ETS Train Tickets from Padang Besar to KL Online!